An interesting "prequel" to the classic tale of the rogue of Sherwood. Well... it is not really a prequel, as it touches some of the same plot as the classic stories, but for some parts it is. It was very exciting to see how the tale began and how Robin became the man of the tales we know. I was not fully impressed though. At times I was confused if I was watching Gladiator or Braveheart and not Robin Hood. In my eyes Robin Hood is a leader of rag-tag rogues not army ranks - he is the prince of thieves. That was not the impression I got from this movie. In my opinion the casting for the main parts of this movie was miles off. 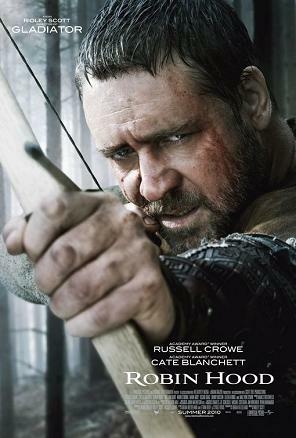 I like Russell Crowe as an actor in general, but he was not the right pick for this part in my opinion. He is best suited as a roughneck army soldier, not a dandy and dashing quick witted rogue. I think this is all too obvious in this movie! Blanchet has never really been my cup of tea. I have no argument on why, that is just how I feel. Therefore I don't see her fitting Lady Marion very well. There is nothing wrong with her acting - she just does not fit the part. Oscar Isaac playing prince John is in my eyes very far away from any British prince. His looks and body language are far too Mediterranean for that part. The action was exciting but maybe a bit exaggerated at times. It brought life to this otherwise VERY LONG movie. Why make a movie 2,5 hours long?? Anyway the action and the classic tale is really what carries this movie. Nicely executed and visually impressive despite being over the top from time to time. In general an exciting movie definitely worth watching! Good movie! I'd heard that there wasn't "enough" action in it, but seriously, I think it was paced perfectly and the action that was there was TOP QUALITY! I quite like the idea of 'giving' Hood a past that explains his later actions. Robin Hood, the spiritual successor to Gladiator, tells the tale of Robin Hood and how he came to be known by that name. Ridley Scott intertwines the story of Robin directly with important historic events (although these aren't exactly depicted that accurately - King Richard dies on the battlefield for instance...) making Robin a much more important character for England, than seen in the previous movies about Robin Hood. The build up the conclusion is very long and slowly paced, which I really appreciated. All my friends thought it was a long and boring build up though and wanted more action, so I guess it's not everyone's cup of tea. Blanchett is as amazing as ever, Crowe in his trademark 'military leader hero' role and Scott is at the top of his game as well. Those three people are some of my absolute favourites so I'm obviously a bit biased. An epic movie I highly recommend. But do not expect the classic Robin Hood tale. Think more Medieval warfare than 'Archer in the woods'. Remember this is a prequel.